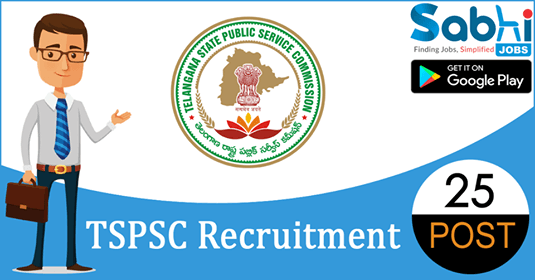 TSPSC recruitment 2018-19 notification has been released on official website www.tspsc.gov.in for the recruitment of 25 vacancies at Telangana State Public Service Commission. The candidate who is looking for Plant Operator can apply online application from 10th August 2018 and before 9th September 2018. Qualification Must Possess SSC with Trade Certificate from ITI in Mechanical or Fitter issued by State Government Competent Authority. Selection Process Selection will be based on Examination (Objective Type). How to Apply Interested and eligible candidates may apply online application form at official website www.tspsc.gov.in from 10th August 2018 to 9th September 2018. Candidates are directed to follow the Commission’s Website (www.tspsc.gov.in) regularly to Know he latest developments regarding the Recruitment, dates of Examination, calling of candidates for verification of Certificates/ Interviews/ Results etc. The candidates are not allowed to bring any Electronic devices such as mobile / cellphones, Calculators, tablets, iPad, Bluetooth, pagers, watches to examination centre. Loaning and interchanging of articles among the candidates is not permitted in the examination hall and any form of malpractice will not be permitted in the exam hall. The candidates are expected to behave in orderly and disciplined manner while writing the examination. If any candidate takes away Answer Sheet of OMR based examination, the candidature will be rejected and in case of impersonation/ disorder/ rowdy behaviour during Examination, necessary F.I.R. for this incident will be lodged with concerned Police Station, apart from disqualifying his / her candidature. The Penal Provisions of Act 25/97 published in the A.P. Gazette No. 35, Part-IV.B Extraordinary dated: 21/08/1997 shall be invoked if malpractice and unfair means are noticed at any stage of the Examination. EDIT OPTION TO THE CANDIDATES (FOR 3 DAYS) Candidates are directed to take note that, after last date of receipt of Applications, Edit option to the candidates will be allowed for three (3) days to make any corrections regarding their Biodata particulars/Data corrections/Omissions etc., in the Online application already submitted to the Commission. After the due date, Data corrections through Online/Paper representations/Corrections on the Nominal Rolls will not be accepted under any circumstances. Candidates are directed to take note that, the mobile number furnished at the time of One Time Registration should not change/modify till the publication of Final Results to avoid any kind of inconvenience to commission as well as candidates to contact / send messages/ one time passwords etc.